Coming into the game we asked for a lot. We wanted better tactics. Check. A better lineup. Check. More drive and passion. Check. Zapata in. Check. Boateng out. Check. And we got it all and then some. Which left us down to 9 men, and asking ourselves, with such an incredible improvement in play and 61% possession, how did we lose that one? It’s definitely a case where we should have been careful what we asked for. The match started a little tentatively, but quickly exploded in a burst of Milan chances. Pazzini and El Shaarawy traded efforts on goal, but it was Mexes in the 7th with an overhead bicycle kick that Brkic had to grab that took my breath away. How many center backs do you see do that? The 4-3-3 was just right this time, Urby was not as visible and involved in play has been in other formations, but Pazzini and El Shaarawy took full advantage of the situation, as Brkic could tell you. The midfield was still the weakest link, weaker than the defense, actually. Nocerino was the invisible man for much of the match, although I’m sure his efforts off the ball were helpful. Montolivo had some nice balls forward and did some good things, but was also a little sloppy in his defending and wasn’t a constant force. Ambrosini held up his end of things okay, but it was interesting how quickly the dynamics changed when he was subbed off. Mexes and Zapata started off with epic defending, and while some of their efforts waned later in the match, I would still say that they are our best starting duo. Mexes especially, was brilliant at chasing down attackers and shut Di Natale down in the 21st, amongst other things. Whereas Zapata also had some big saves, including a tackle at the edge of the pitch in the 23rd. Or in the 27th, when an error by Montolivo led to Mexes trying to chase down the Udinese player, and Zapata pushed harder, ran faster and cleaned up the mess. He also looked to have taken a knock in that effort, let’s hope he’s not injured. Abate was kind of quiet, but he worked nonstop like he always does. I would say he was better defensively than offensively today. 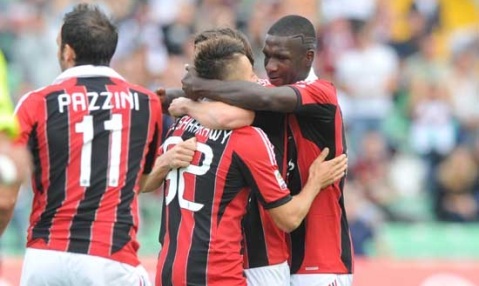 But the one everyone loves to hate, getting his first start this season was Mesbah. He was quick and hardworking, and in the 9th, he even sent a cross in that was almost a shot. In the 12th, it was his header back at the other end that saved a chance on goal for Udinese. Granted, there were moments like in the 26th where he was channeling his inner Antonini and sent a cross in for some ghost player no one else saw, but we was more effective and had more important plays in the game than Abate today. He was also tough, doling out tackles as often as he was tackled, and hard, too. He’s not my dream left back, but he’s better than Antonini, and he’s way better than most people give him credit for. In the 39th, Ambrosini got a yellow for a really dumb foul. My theory is if you’re going to get carded, you should make it worth it. But I didn’t have long to be angry at him, because in the 40th Ranegie took advantage of Abbiati having come out to deal with an incoming free kick and just headed the ball over and into the net. 1-0 Udinese. All of that amazing attack, all of that working better together and maintaining possession and keeping Brkic on the ropes… all down the drain with one lapse of form. 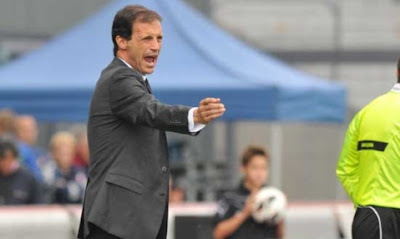 For those of us who feel Allegri’s time is up, he did everything to prove us wrong today. He subbed in the 53rd. He took off the slower, defensive Ambrosini and brought on Boateng. And there was an immediate impact, as it was Boateng’s ball forward that led to El Shaarawy’s wondergoal in the 54th. 1-1. As Milanista11 pointed out in the comments, it was his 3rd Serie A goal, all scored against Udinese. Will his hunger for goals transfer to other teams now? The 57th saw Abate elbowed in the back of the head, the guy is so tough. And then things started going downhill rapidly from there. In the 64th, Zapata earned himself a yellow card for a rough challenge. Two minutes later, he earned himself his second in the box, as well as an early trip to the showers. You want Zapata to play? Be careful what you ask for. Milan down to 10 men, penalty awarded. Di Natale stepped up, and of course, converted it, 2-1 Udinese. The only bright spot in there is that Abbiati had perhaps his best save on the night in the 64th against Di Natale, Abbiati was brilliant with 6 saves, all big. So on 10 men, Allegri once again forced into a sub. Usually, it’s for injury, but this time for a sending off. He sacrificed Urby, who was not being terribly effective anyway, and brought on Acerbi to shore up the defense after Zapata’s exit. And that was when I first noticed Nocerino was playing. (to be fair, the broadcast I watched was kind of low resolution.) Nocerino was subsequently subbed off for Bojan in the 79th. To add to our misery, in the 75th, Boateng got a yellow. He played very recklessly and had more than enough rough challenges to warrant multiple cards. But his 2nd yellow in the 84th was just silly. I think it's official that he's lost his swag this season. You wanted him benched? He was benched, but when he came on, he was worse. Be careful what you ask for. Now Milan were out of subs and down to 9 men. Ouch. 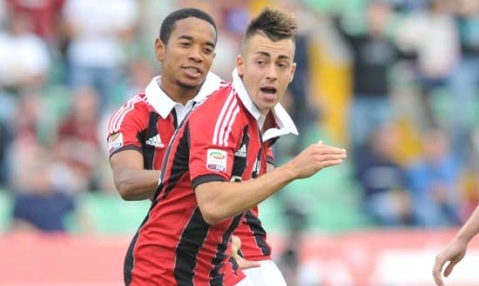 However, Milan did not stop attacking. While cracks were definitely showing, (how could they not down 2 men?) they did everything they could to keep fighting for possession and still taking shots. In the 87th, Acerbi took a knock, again, let’s cross our fingers for no injuries. And in a bit of irony, in the 92nd, Montolivo was the last defender for us as Udinese attacked. For me, though, that just showed the grinta, or grit and determination, of this squad today. Everyone worked hard, no one was lazy. Not everyone was effective, and especially with a newer formation, that is completely forgivable. Now we just need more discipline. Two guys got sent off? The other 9 worked that much harder to stay in the game. You wanted them to run, to work harder, to play with more passion? Be careful what you ask for. Do we really want him gone? Be careful what you ask for. For me, the result was deserved, as Udinese did a better job at capitalizing on their chances. But it was also heartbreaking, knowing what these guys have been through and seeing such a vast improvement today over last week and even Tuesday vs. Anderlecht. If the points were awarded for effort, Milan had this one all the way. They stunned Udinese in the opening minutes and gave hope back to fans far and wide. But it’s not effort, it’s results that give you points on the table. So I would say now we need to press for results. But then again, after today, I would be careful what I asked for.